BARRIERS To CREATIVITY. 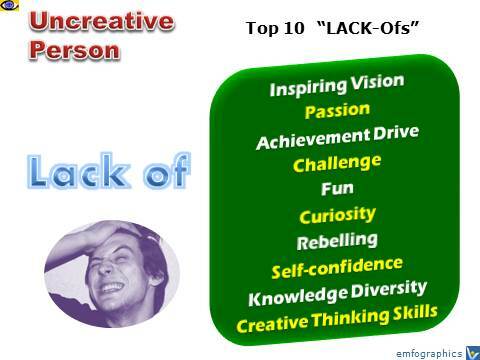 Uncreative Person: Top 10 Lack-Ofs. What prevents people from being creative. Traits of a Loser. How To Develop Creativity. What To Avoid. An inspiring vision of a brighter future provides both direction and motivation. Your vision leads you, it sparks your creativity. And vice versa, lack of vision holds you back, makes you travel in circles. And that’s not inspiring at all. Creative people have one thing in common – they love what they are doing. Carl Gustav Jung once said, “The creative mind plays with the object it loves.” If you have no passion for what you are doing, your creative mind stays idle as it has nothing to play with. Your attitude determines your way of thinking and drives your behavior. If you want to be more creative you need to have the right achievement-focused mindset. Inability to spot emerging challenging opportunities as well as lack of drive for challenging assumptions and the status quo keep your creative mind sleeping. People are unlikely to be creative if they don't like their project, business or company. Act like a child. Introduce more fun into your daily living. Fun frees the brain from concerns that impede freethinking, makes failure easier to handle, and turns life into a continuous creative activity. Overacceptance of the status quo, clinging to things remaining constant and not changing, and lack of critical thinking inhibit creativity. If you cannot break out of self-imposed limitations, don’t dare to be different, and are afraid to be wrong you will never create anything worthwhile. I-know-it-all attitude kills creativity at source. Confidence is good, but overconfidence limits your possibilities and options. If you are certain that your approach is the right one, you don’t search for better alternatives. You won’t unlock your ability to create innovative synergies if you don’t build your cross-functional expertise and don’t cross-pollinate ideas with other people. The good news is that creativity is a talent and a skill that can be learned and enhanced through creative action. Just practice it as often as you can to make creative thinking and creative action your winning habits.